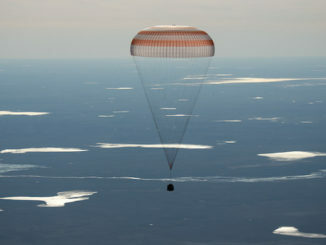 Carrying three space station crew members back home after 173 days in orbit, the Russian Soyuz MS-02 landing craft touched down in Kazakhstan on Monday after a parachute-assisted descent through clear skies. 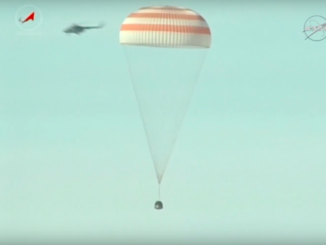 Remarkable video shot near Dzhezkazgan, Kazakhstan, shows the Soyuz capsule descending under parachute for an on-target landing. The touchdown safely capped the three-man Expedition 50 crew’s 173-day mission to the International Space Station. 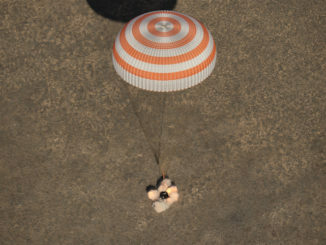 Astronaut Shane Kimbrough and his two Russian crewmates — Soyuz MS-02 commander Sergey Ryzhikov and flight engineer Andrey Borisenko — undocked from the International Space Station and plunged back to Earth Monday, landing on the steppe of Kazakhstan to close out an extended 173-day mission. 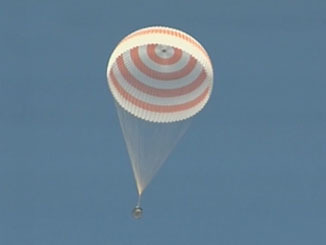 Outgoing space station commander Shane Kimbrough and two Russian crewmates returned to Earth on Monday, riding a Soyuz capsule in a bubble of hot plasma to a parachute-assisted landing in Kazakhstan. 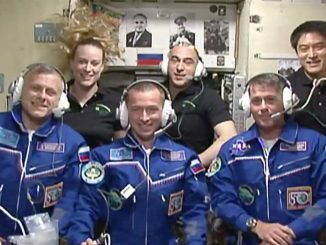 The trio undocked from the space station at 0757 GMT (3:57 a.m. EDT) and landed on the Kazakh steppe at 1120 GMT (7:20 a.m. EDT) Monday. 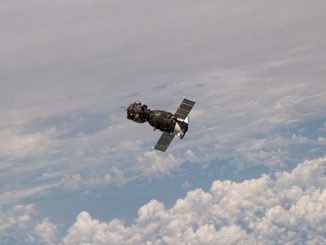 The three newest residents of the International Space Station sped into orbit Wednesday aboard a Soyuz launcher after liftoff into an overcast sky over the Baikonur Cosmodrome in Kazakhstan. These photos show the crew putting on their spacesuits and their mid-afternoon launch. The Russian Soyuz MS-02 spacecraft carrying two cosmonauts and an American astronaut successfully docks to the International Space Station after a two-day trek from Earth. 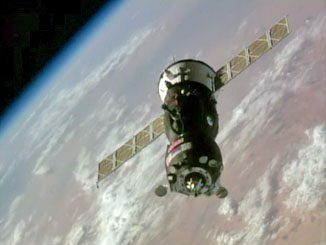 An upgraded Soyuz ferry ship, the second in a new series featuring improved avionics, navigation and other systems, glided to a flawless docking with the International Space Station early Friday, bringing three fresh crew members to the outpost and briefly boosting the lab’s crew back to six. 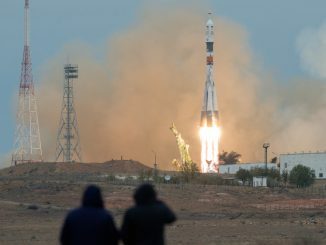 A Russian Soyuz spacecraft carrying two cosmonauts and a NASA shuttle veteran blasted off from the Baikonur Cosmodrome in Kazakhstan Wednesday and set off after the International Space Station. 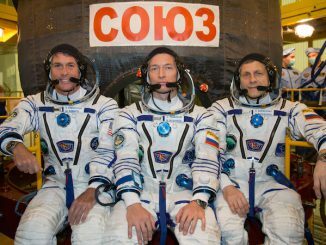 A U.S. Army veteran of Operation Desert Storm, a Russian Air Force MiG-29 fighter pilot, and a former flight controller for Russia’s Mir space station arrived at the International Space Station on Friday, with a smooth docking aboard a Soyuz spaceship at 0952 GMT (5:52 a.m. EDT), two days after a successful launch from Kazakhstan. 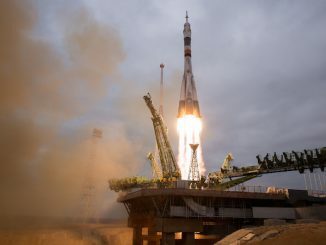 Running nearly a month late because of work to repair a damaged cable, a Russian Soyuz spacecraft was primed for launch early Wednesday to carry two cosmonauts and a NASA astronaut to the International Space Station, boosting the lab’s crew back to six.